“Living standards in Britain have suffered their most prolonged decline for at least half a century, according to official data that has been seized on by Labour as further proof of a cost of living crisis under the coalition. This happened because Western governments gave priority to saving the complex and deregulated financial structures that had developed over the last 40 years. They had an easy run, because of the deep-seated fear of state power that was a legacy of 1960s radicalism. Most protests go no further than saying “it should not happen”, rather than demands for re-regulation. People remain equally suspicious of the state and big business, meaning that big business gets to decide what the state should and should not regulate. It’s not that large numbers of people like the outcome of the deregulationist and anti-state pattern that Thatcher and Reagan began. Inequality is correctly seen a source of endless quarrelling and ill-feeling, unless there is some clear and fair basis for it. No one minds a modest extra for people who have earned it, done something that deserves a proportionate reward. But people increasingly think that managers are vastly overpaid, while many bankers get ludicrously large rewards for doing the wrong things. Well-qualified individuals like doctors, scientists or airline pilots manage fine on two or three times the average income, maybe 40K to 70K in Britain. So why do a few managers and speculators need to get vastly more? Very few people would rate them as being ten or twenty times as valuable and deserving as a worker on the average wage. Never mind hundreds or thousands of times more valuable and deserving, which would be the logic of saying that they’d earned it. Speculators and dealers are mostly getting vast rewards for legalised financial crimes. Things that were banned after the Wall Street Crash and Great Depression, and which the finance industry successfully lobbied to get restored. Of course the New Right won almost by default in the Age of Coolhearts, the era when 1950s technocracy and 1960s radicalism both lost favour. In Britain, the organised working class in the Trade Union movement was dominant in the 1970s. But the newly popular “coolheart” outlook was deeply hostile to translating this into any sort of formal arrangement. The Bullock Report offered extensive Workers Control, worker representatives on the Board of Directors. The left much preferred an endless round of formless militancy, and were utterly astonished when this led to Thatcherism. Thatcherism appealed to a widespread gambling spirit, people hoping to be among the few who got the big prizes. The legalised financial crimes of the new finance did make a few people very rich from humble beginnings. More importantly, it gave false hopes to many more. “In Spain more than 3.4m homes lie vacant, in excess of 2m homes are empty in each of France and Italy, 1.8m in Germany and more than 700,000 in the UK. “There are also a large numbers of vacant homes in Ireland, Greece, Portugal and several other countries, according to information collated by the Guardian. “Many of the homes are in vast holiday resorts built in the feverish housing boom in the run up to the 2007-08 financial crisis – and have never been occupied. But while people complain, they don’t call for legislation to make speculative building unprofitable if it fails to meet human need. Nor do they call for a resumption of the broadly successful policy of public housing, Council Houses in Britain. There were mistakes made in such systems, of course. Tower blocks that Britons found uninhabitable, though other nationalities seem fine with them. And housing estates that were solid houses without the normal shops, pubs etc. But the whole program could be resumed with the correct lessons learned. What’s happening just now is the reverse. New benefit rules amount to a wealth-based “ethnic cleansing”. It’s not quite a matter of class, the new elite accept social mobility at most levels, though the Old Etonians and similar are back on top. But they’d be happy to see the poor squeezed out of London. “Concerns about the cost of uncollected student debt, currently totalling £46bn, have grown following the rise in tuition fees for British students to £9,000 a year that increased the financial burden on graduates. But was recovery of the money ever the main intention? I’ve heard it suggested that “the main function of the thing was to bring about a cultural change in the attitude towards debt. What better way than making debt compulsory among the most immature and impressionable sector of the community? It was ‘sold’ on the basis that a higher education qualification will guarantee a higher income in the future and the debtor could have jam today with the promise of more jam tomorrow. The same reasoning was involved in the policy of the council house sell-off. The old idea that debt was to be avoided if at all possible was destroyed on the back of council-house mortgages and student loans. Neither makes any sense in social terms but makes absolute sense in terms of the requirements of financial capitalism in the 80s and 90s”. I share this view. Student Loans encourage the view of life as a burden on money, and money as the main measure of human worth. People accept this, or else chose an ineffective anarchic drop-out mentality. Anything to get away from the Mixed Economy view that the state can do a lot to foster human wealth, ignoring profit and loss. We in the Ernest Bevin Society are almost the only people in Britain or Ireland who still say this without qualifications or evasions. Which is discouraging, but the other methods are visibly not working. And in the wider world, this is still the norm. A big loss of confidence in Anglo values is quite likely in the long term. One feature of the Age of Coolhearts has been a lack of belief that there is anything worth suffering for or dying for. This has very much included the hard-core New Right, though they have been quite successful in getting others to die on their behalf. A “Book of New Right Martyrs” would be remarkably short of people you could put in it. (Which is not true of other right-wing causes, of course, including some that most of today’s West Europeans would view as obnoxious.) So the whole thing could collapse much more rapidly than it rose. Commerce long ago learned to put a nice name on whatever you’re trying to sell. So plans for a capitalist restoration in the 1980s were called “reforms”. They were an attempt at reverting to what had existed in the 1920s and should have been called “reactionary”. But this didn’t happen. Most left-wing critics made silly comparisons with Nazism, which didn’t stick. The New Right should have been taken on over their belief in “Miraculous Mammonism”, the notion that people pursuing private profit would produce an ideal result through market mechanisms. Now this can happen sometimes, just not often enough. The arguments ignoring all the times when it fails and the state knows better. What’s resulted has been a growth of inequality without any improvement in average economic growth, meaning that everyone has lost out except the very rich. In Britain, unlike the USA, the working mainstream are better off than they were in the 1970s, certainly. But no more than if the Mixed Economy had been fixed rather than repudiated after its 1970s crisis. To make this clear, I decided to go back as far as there are reliable figures. 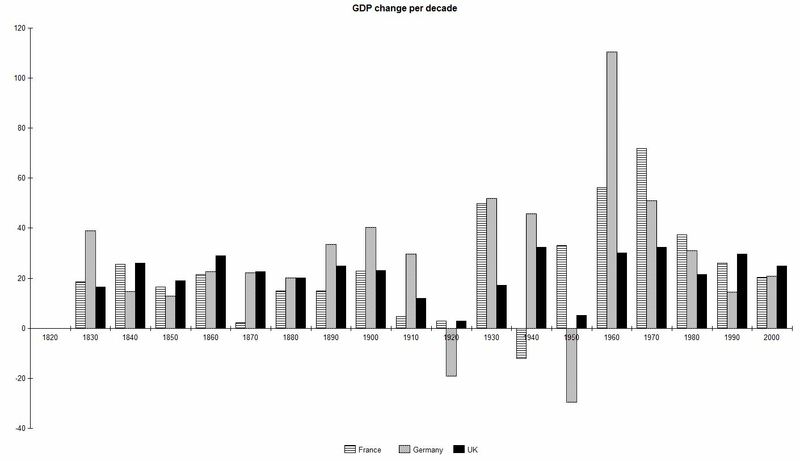 And to look at GDP growth from one decade to the next, rather than year by year, which can be too variable. Britain astonished the world with its initial Industrial Revolution, beginning in the 1760s. 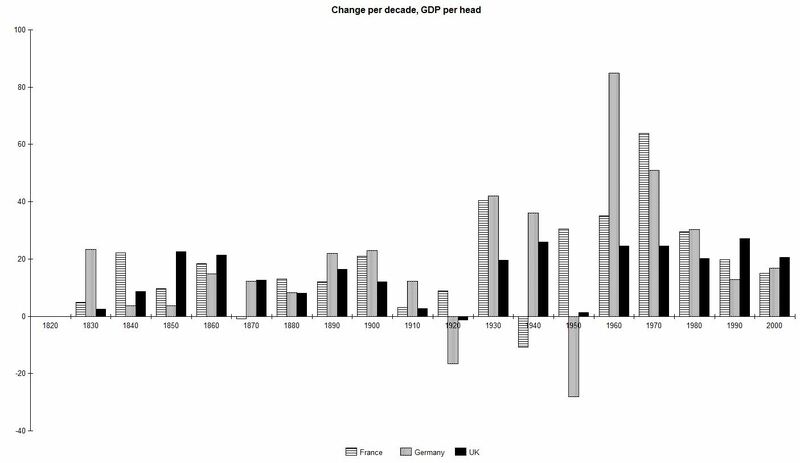 But by the 1830s, which is when the figures start, the rest of Western Europe was adjusting. Al Gore’s spiel about Climate Change, filmed and available as “An Inconvenient Truth”, turns out to be nothing like alarmist enough. He also left himself vulnerable by talking about “Global Warming” (though I think that it was the norm at the time). He didn’t give the proper emphasis to the probability of much bigger fluctuations within a general warming trend. So he might seem to have been refuted by a sudden cold snap, never mind that there were also drastic drought and unprecedented heat at other times and/or in other places. I mentioned last month that while the US was having unusual cold, Scandinavia had an unusually mild winter, while both Australia and Argentina had heat waves. (Our winter is their summer, south of the equator.) Meantime a period of usually rainy weather in Britain was nothing so bad at first, but got increasingly disastrous as the land became saturated and far more rain than normal kept falling. A simple rise of a degree or two would not be as serious as what’s now happening. What we have is Climate Change, a major shifting of the weather patterns. Climate scientists believe that the last 10,000 years have been unusually stable compared to most of the Earth’s history. If this is correct, then almost any major change is going to make the weather much less predictable and more likely to show patterns we’d have viewed as extreme and unlikely. The arctic has warmed far faster than anyone predicted. Science always has some uncertainties, but that can mean “worse than predicted” as least as often as it is “not so bad”. Since scientists are generally very cautious about predictions that they know will be unpopular, “worse than predicted” is usually the best bet. A warmer arctic seems to make a weak jet-stream more common. A weak jet-stream can no longer plough its way through existing weather patterns, meaning that these patterns last a lot longer than normal. Specifically, Western Europe and Britain especially get prolonged bouts of flooding, drought, unusual heat and unusual cold. These might average out to something not so different from the weather we know, but that’s not the main point. And the cause? It was long ago predicted that Greenhouse Gases would cause a general warming trend, plus more weather extremes. Climate models showed most of the world getting warmer but a few areas getting colder. Climate models are not yet powerful enough to predict in detail how weather patterns would shift or which climate extremes would actually happen. But it was overwhelmingly likely that things would get worse. All of this was bad news to the rich, because a fix would cost money that the rich would rather spend on themselves. It would also damage their general view of themselves as Heavenly Creatures, beings far above the “plebs”[vi] and in control of the world. It would be convenient to say “the fault lies in our local star, not in ourselves”. But it would also be amazingly foolish, since the changes that we see are the sort of thing that was predicted, whereas many attempts have failed to prove a reliable link between minor changes in the sun and the weather here on Earth. Yes, the sun is behaving slightly oddly. But it’s moot if this matters. The best guess is that it has had a slight cooling effect, to set against the overall warming. Which means things will get even worse if the sun gets back to normal. All of this impacts directly on the issues of Fracking and Shale Oil. New techniques suggest that the Age of Petrol could be extended for a few more decades, if the issue of Greenhouse Gases could be ignored. This would suit the New Right, whereas an acceptance that we mostly cause our own bad weather would suggest global regulation and less choice for private capital. And there are billions to be made from Fracking and Shale Oil, if governments allow them to be freely developed. “In 2012, Cameron sacked a green energy minister, Charles Hendry, and appointed a climate change skeptic, Owen Paterson, as environment secretary. Where being green had once been a defining mission, for Cameron and others it had become a financial burden and a source of party division. Last year, Cameron was said to have been wandering around Downing Street talking of his wish to be rid of all this ‘green crap'”[vii]. This comes on top of a reluctance to spend money allowing for future floods. Labour is not innocent on this matter, but the Tories have definitely been worse. [ix] Traditional Tory heartlands are among the worst hit, but the Tory leadership was long ago captured by people tied to finance and committed to shrinking the state. It is no longer an authentic conservative party, it is a party run by the rich for the rich, though with traditional conservatives still attached to it. Current estimates say there is a three-to-one chance of a major El Nino event this year, meaning a hot summer almost everywhere. We’ll have to wait and see about that. Even if we get lucky on that one, more and more extremes are going to become the new normal. Representative Democracy is only one of several possible democratic systems. It works very badly when the society is split on ethnic or religious lines. Before the Orange Revolution of 2004, Ukraine showed some signs of following the Russian example and stabilising itself. President Leonid Kuchma was getting there, and the Ukrainian presidential election of 1999 was the only one that broke through the polarisation, with both Kuchma and the rival Communist Party candidate bridging the east-west divide. [xi] Kuchma was in favour of closer ties with the European Union, as well as good relations with Russia. But scandals including allegations of ordering the murder of a journalist destroyed him and re-polarised the country. It’s been a mess ever since, one that could easily lead to the same pattern as Former Yugoslavia, a mix of fragmentation and ethnic cleansing. The pro-Western elements are refusing to recognise that Russian-speakers have any rights at all, making Ukrainian the only official language. Which contrasts with actual West-European practice, where many states have multiple official languages to accommodate existing minorities. The current position is an on-going car-wreck. At the time of writing, a “unity” government has been postponed to Thursday 27th. It may not happen at all. Meantime Crimea is definitely thinking about seceding. It has been separate from Ukraine for most of its history, first part of the Ottoman Empire and then taken by the Tsars, but mostly ruled as part of Russia. It was given to Ukraine in 1954 without any consultation, at the whim of Nikita Khrushchev, and contains a major Russian naval base at Sevastopol. [xii] A sensible Ukrainian Nationalist might be glad to be rid of it, but the West is probably targeting it as a way to weaken Russia globally. As in Former Yugoslavia, Western politicians are likely to create a devastation and call it someone else’s fault. The USA is still fighting old battles, campaigns that were once liberating but are no longer relevant, state power exercised overtly by an aristocratic elite. The new elite is much cleverer and manipulation and careful not to be seen as aristocratic. And far too many ordinary whites identify with this white elite and concentrate on distancing themselves from non-whites. And Afro-Americans, at least, share the asocial vision of the poorer whites, though they naturally do so on the basis of different cultural values. This explains the sad defeat of Trade Union organisation at a Volkswagen car plant in the southern state of Tennessee. It was close, 712 to 626 with an 89% turnout, but it is a clear setback. [xiii] And it ended the immediate prospect of the USA seeing worker representatives on the board, a German pattern that might have been extended there. Ordinary US citizens are a bunch of sheep who’ve been persuaded that they are actually lions and tigers and bears. Many of them showed great resentment at being saved by Roosevelt’s New Deal. A relatively minor crisis in the 1970s was an excuse for going back to methods that had failed before. And have now failed again in much the same manner, except that this time round, the state rescued the financial institutions. Chinese banks have a balance-sheet that would be disastrous for a Western bank, full of bad debts. But it is all internal. China has avoided foreign debts, so while it has competent political leadership, it is in no sort of trouble. The elite does not have the same privileges that it has in most of the world, which have been added to since the 1980s. But elites are highly replaceable – most of them have done their best work before they become rich and famous. After numerous warnings of doom, the Sochi Winter Olympics have ended up as a considerable success for Russia. A demonstration that the place is still strong and competent. If it cost a lot, it has been an extremely good investment. Reputation counts for plenty in the modern world. It’s also noticeable the criticism on the BBC faded a lot after Britain won a few medals. But the greatest haul went to Russia, an improvement on their performance in previous Winter Olympics. You’d make yourself pretty unpopular in Britain if you suggested that Britain should have made peace with Hitler in 1940 after the Fall of France. This despite Hitler’s wish to preserve the British Empire if it would accept him as ruler of Continental Europe. In the case of Russia, Hitler was out to destroy Russia as an entity, not just its Communist regime. And the Siege of Leningrad was second only to Stalingrad in stopping the invasion and reversing the tide. So I’m not in the least surprised that ordinary Russians were enraged when someone asked whether it might not have been better for Leningrad to have surrendered and avoid the sufferings of its prolonged siege. Or that this public anger caused the closure of a minor dissident TV channel. Most Russians have anyway stopped being sympathetic to dissidents, after the Yeltsin years showed that it was easier to criticise than to rebuild. “Just a question”, people say. OK, try asking “do you agree or disagree with Hitler’s policy towards the Jews“. It would never be tolerated, and fair enough, but it is really no more outrageous. Or you could see the reaction in the USA if you asked “did Imperial Japan have strong justification for their attack on Pearl Harbour”? Which in fact they did, with the US sanctions threatening to destroy their economy, but it would certainly not be popular. The Western strategy of trying to make the Russians ashamed of their own history has basically failed. But the media somehow fail to notice this. It will be interesting to see how the media handle the 100th anniversary of the immediate cause of World War One, the assassination of the Archduke Ferdinand (and also his wife). They got away with demonising the Serbian claim to Bosnia- Herzegovina in the 1990s. But exactly the same claim was behind the assassination. The specific issue on which the war began was Austria-Hungary’s desire to investigate whether this was state-sponsored terrorism, which was an eminently plausible suspicion. This was the point on which Serbia refused to yield, which suggests that those suspicions were correct. But why did Britain join in? For many years, there had been a growing view among the elite of the British Empire that Germany was the main immediate threat to British global hegemony. But this did not much concern ordinary Britons, who by the early 20th century had become sufficiently powerful to stop a war they disagreed with. This explains the otherwise baffling ambiguity over Belgian neutrality when a Franco-German war began to seem likely. A definite statement that a march through Belgium would bring in Britain against Germany would probably have persuaded them to use some other plan, or perhaps avoid war completely. The fact that it was all left vague until Germany was committed suggests that it was just a pretext. I’m not sure it will end in such a crash. Perhaps he’s still too orthodox, over-estimating the power of market forces and under-estimating the state. While Western governments are allowed by the electorate to squeeze ordinary people to preserve the wealth of the rich, the situation remains stable. The current leaders know that a crash would probably mean the end of their values and their hegemony. In the absence of popular rejection of their values – which has yet to happen – they have every reason to carry on. [iv] I’ve shown the change since the start of the last decade. Figures only start in 1820. I took the average of 1830 and 1850 for Germany 1840, since no figure was given. [vi] It’s disputed whether a Tory minister said “plebs” during a famous argument with police outside of Downing Street. But not disputed that he used the term on other occasions.